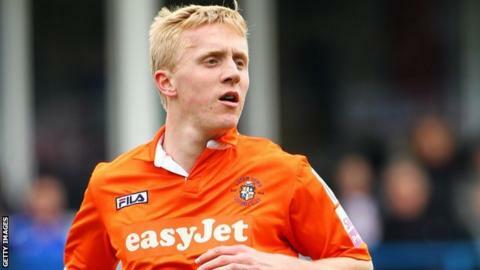 Goals from Mark Cullen and Andre Gray gave Conference Premier champions Luton Town victory over Welling United. The Hatters duo linked up for the opener, with Gray supplying Cullen, who coolly slotted past keeper Lee Butcher. Gray doubled their lead when he latched onto a long ball, beat two defenders and drilled home for his 28th goal of the season. Ross Lafayette's curling effort pulled one back for the host's with five minutes to go, but Luton held on. The Hatters were handed the title on Tuesday without even playing, following Cambridge United's defeat by Kidderminster. And after the final whistle on Saturday manager John Still and the players were mobbed by jubilant fans, celebrating their return to the Football League after a five-year exile in non-league. Match ends, Welling United 1, Luton Town 2. Second Half ends, Welling United 1, Luton Town 2. Toby Ajala (Welling United) wins a free kick. Jon Shaw (Luton Town) wins a free kick. Attempt saved. Joe Healy (Welling United) left footed shot from outside the box is saved. Foul by Tom Bender (Welling United). Foul by Alex Lacey (Luton Town). Goal! Welling United 1, Luton Town 2. Ross Lafayette (Welling United) right footed shot from the left side of the box to the top right corner. Assisted by Toby Ajala. Goal! Welling United 0, Luton Town 2. Andre Gray (Luton Town) right footed shot from the centre of the box to the centre of the goal. Assisted by Matt Robinson. Substitution, Welling United. Malik Ouani replaces Tobi Sho-Silva. Substitution, Welling United. Toby Ajala replaces Josh Wakefield. Substitution, Luton Town. Jon Shaw replaces Alex Wall. Offside, Welling United. Tobi Sho-Silva tries a through ball, but Tobi Sho-Silva is caught offside. Josh Wakefield (Welling United) wins a free kick. Foul by Tobi Sho-Silva (Welling United). Andrew Parry (Luton Town) wins a free kick. Attempt saved. Andre Gray (Luton Town) right footed shot from the left side of the six yard box is saved. Attempt saved. Mark Cullen (Luton Town) right footed shot from the centre of the box is saved. Attempt missed. Andre Gray (Luton Town) right footed shot from the centre of the box misses to the right.